Live Paint is a tool for coloring closed shapes. The main difference of coring with Live Paint rather than using the basic coloration method is that Live Paint creates a dynamical object. This means that if you modify the lines that create the closed shape, the color can readapt to this change and follow the new boundary. Before creating a live paint object you should do a bit of Illustrator housekeeping. Make sure all the colors or patterns that you are planning on using in your live paint object are in the swatches panel. If you are creating new colors or patterns for a specific live paint it is helpful to create a new folder with these colors. Also, you want to double click on each swatch icon you will be using and make sure the “Global Swatches” option is turned on. This means that if later you decide that all the areas painted red should be pink you can just change the color in the swatch options and the whole document will be automatically updated. You will know that a swatch is a global swatch because the bottom corner will be white. Rich Black – In Illustrator 100% K is the default black. In some newer versions of Illustrator, however, Rich Black is the default printing setting for all blacks. It is good practice to create a global swatch that is Rich Black (C-50%, M-50%, Y-50%, K-100%) and use it for everything you want to be true black. Your black appearance and printing settings can be adjusted in the control panel by clicking control + K.
Select all intersecting objects ->click live paint icon in left hand tool bar. As you are painting areas you can use the left arrow key on your key board to scroll through color options. This is why it is useful to make a folder with the colors/patterns you may use. If you want to change a stroke hover over the stroke area and a paint brush icon should appear. Strokes can be different colors, thicknesses, or dashed. If you do not want a stroke to show you should make it 0pt rather than deleting it. Once you have selected line work and clicked the “live paint” icon Illustrator treats all these objects as one live paint group. Double clicking on the object as a whole allows you to move objects around without losing live paint relationships. You can also add objects to a live paint group by dropping them into the live paint group in the layers panel. If you want to recolor specific parts of your live paint object it is easier to use the live paint selection tool rather than double clicking into the live paint object and painting with the paint bucket. Also Live Paint tool allows you to automatically close possible gaps that your line work might have. For instance, if your lines do not form closed shapes, it is difficult to colorize because the color goes of the boundary. You can close the gaps of your line work by selecting your lines, going to the Object menu, Live Paint , Gap Options... A window will pop up where you have to define the size of your gaps that you want to close. 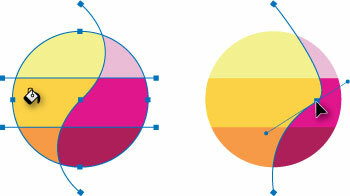 You will notice that Illustrator automatically shows the gaps in red color and it joins them with a straight line. If you want to delete the colorized shape you created with Live Paint you can select the Live Paint Selection Tool , which is placed in the same tab as the Live Paint tool, select your shapes and delete them. Retrieved from " http://studiomaven.org/index.php?title=Tool:Part_23942 "